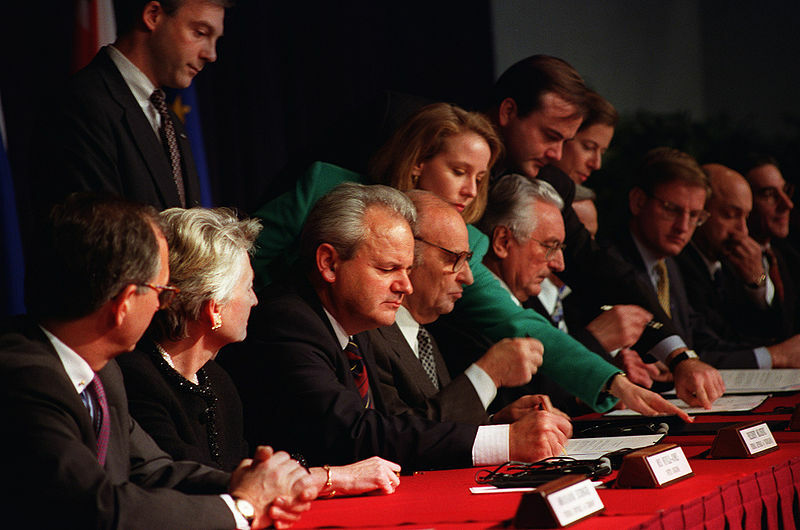 In November 1995, the Dayton area hosted the mediation process for ending the War in Bosnia, which resulted in the December signing of the General Framework Agreement for Peace in Bosnia and Herzegovina, also known as the Dayton Agreement, Dayton Accords, Paris Protocol or Dayton-Paris Agreement, (in Serbo-Croatian: Dejtonski mirovni sporazum). Globally, the word “Dayton” means “Peace” — A huge opportunity! The Dayton Peace Accords negotiated in Dayton during 1995 was profound in two ways. First, it stopped the Bosnian War that had caused the death of over 100,000 people and displaced millions from their homes. Second, it created a legacy for Dayton as the city where the peace was negotiated. Today, Dayton means “peace” to millions of people around the world. Note: Introduction page at the time of joining International Cities of Peace. For updates, contact the liaison. 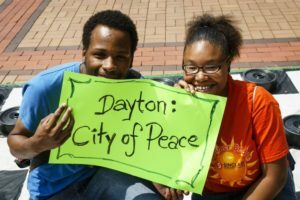 As a result of this legacy, the “Dayton: City of Peace” initiative is not owned by any one organization or group but comprises a diverse, regional, cross-culture of citizens intending to bring the promise of peace home to the Dayton region. Since 1995, an array of peace initiatives have made Dayton a true international hub of peace. Today, a network of business, government and community leaders is beginning to work to leverage this amazing opportunity. Lately, the Dayton City Commission passed an Immigrant Friendly City resolution to encourage and acknowledge the potential power of recent and future new citizens. “Dayton: City of Peace” can, indeed, be a powerful promotional campaign, yet it’s much more substantial. It’s a multifaced, sophisticated effort to build a sustainable community with the core value of the American Dream: a life of peace. 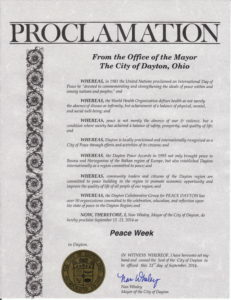 On International Day of Peace, September 21, 2010, the Mayor of Dayton, Gary Leitzell, and the City Commission officially recognized Dayton, Ohio: City of Peace. The Proclamation was read at the Missing Peace Art Space to an audience of mostly young people by then City Commissioner Nan Whaley. This photo collage is an astounding display of UNITY and peace-building in Dayton, Ohio for Peace Month, 2016. 100 participating organizations; thousands of kids and adults; 35 events the whole month of September honoring the U.N.’s International Day of Peace. When those who gather in the streets for peace overwhelm those who lurk in the shadows of anger, we will emerge from the ignorance of violence.